The product will dip approximately 25-30 pair of drumsticks at room temp. above 70 degrees. Dries overnight for next day use. 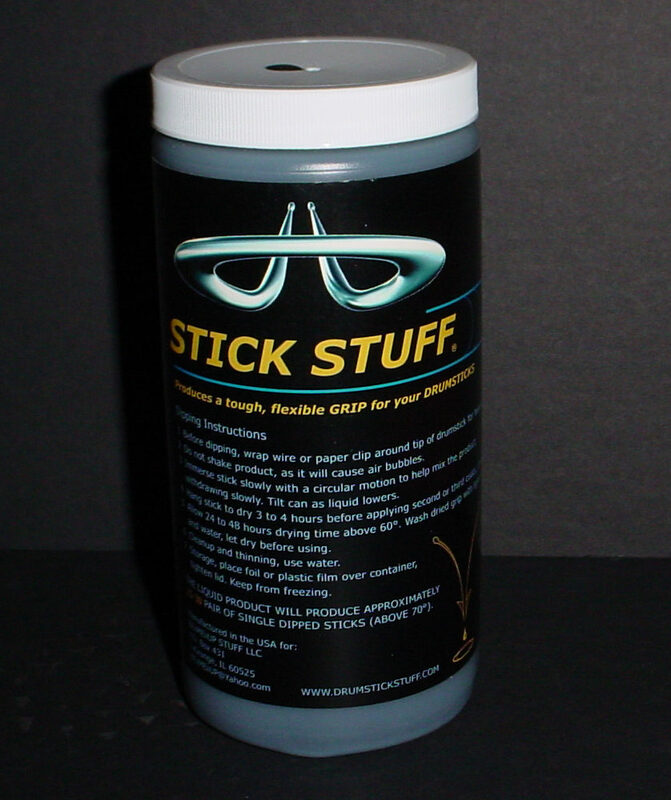 Stick Stuff Blue 80% Thin-20% extra grip 18fl.oz. This is the special Van Romaine mix of 80% thin 20% Extra Grip. 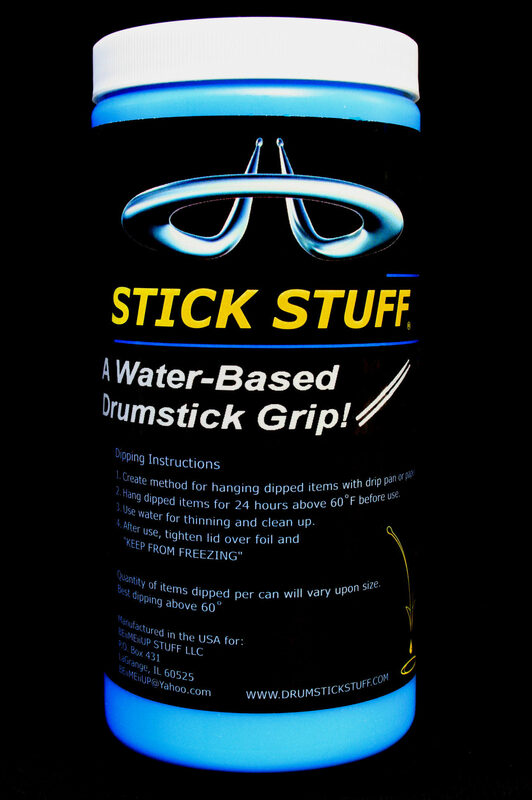 STICK STUFF is a water-based liquid product sold in 18 fl.oz. containers for drummers to dip their OWN DRUMSTICK of CHOICE. Colors are: Clear original, Black, Red, Blue, White and (Chartreuse- Yellow, Green, Orange are black light glow). THE CAN IS 6 INCHES TALL WHICH WILL ALLOW YOU TO DIP A GRIP 6-6 1/4 INCHES UP THE DRUMSTICK. You can also buy a 1″dia. PVC tube, cap the end and dip the whole drumstick. 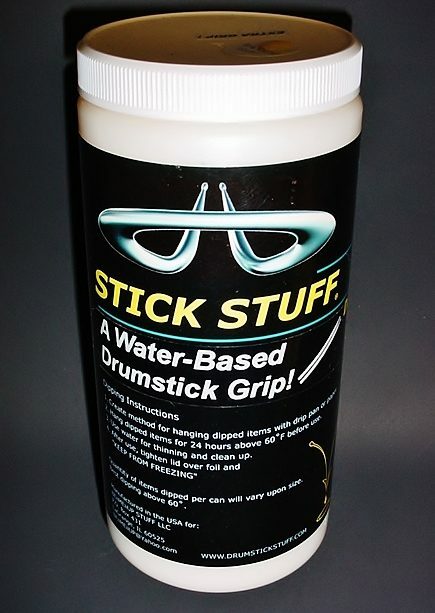 BLUE STICK STUFF GRIP is a water-based liquid product sold in 18 fl. oz. jars for drummers to dip their own drumstick of choice which produces a grip coating once dried. The product will dip approximately 20-25 pair of drumsticks at room temp. above 70 degrees. Dries overnight for next day use. 6-6 1/4 INCHES UP THE DRUMSTICK. You can also buy a 1″dia. PVC tube, cap the end and dip the whole drumstick. 25-30 pair of drumsticks at room temp. above 70 degrees. Dries overnight for next day use. Stick Stuff Clear Extra Grip 18 fl.oz. Jar Black Light Glow! Clear Original Thin Grip (black light glow) DRUMSTICK GRIP DIP, STICK STUFF is a water-based liquid product sold in 18 fl. oz. containers for drummers to dip their, “OWN DRUMSTICK of CHOICE”, producing a thin rubber grip, once dried. The product will dip approximately 25-30 pair of drumsticks at room temp. above 70 degrees. Dries overnight for next day use. 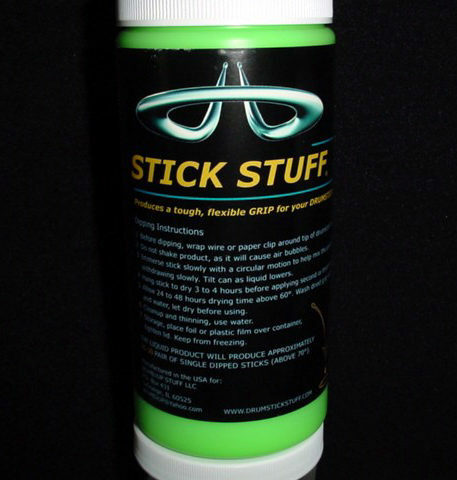 Stick Stuff Neon Green 80%Thin-20%Extra grip 18 fl.oz. This is the special Van Romaine mix of 80% thin 20% Extra Grip Clear. STICK STUFF is a water-based liquid product sold in 18 fl.oz. containers for drummers to dip their OWN DRUMSTICK of CHOICE. Colors are: Clear original, Black, Red, Blue, White and Chartreuse- Yellow, Green, Orange.